‘Twas the Friday before Christmas and all through the district, the creatures were stirring… You would think this past week would be the quietest week of the year for school-related news, surpassed perhaps only by next week. Alas, it wasn’t to be. Quite a bit took place this week. I was tempted to rush off to the keyboard a number of times, but instead chose to sit with things and let my thoughts collect. That reflection has allowed me to realize that this week’s events are less about what’s on the surface and more about what lurks below. That said, let’s dive in. Every year, the Nashville Chamber of Commerce puts together a committee to study the state of Nashville’s schools. The committee dissects the available data, visits schools, talks to administrators, and then submits a Report Card of its findings and recommendations. This is usually followed with a large clamor, which then dissipates into nothingness. Perhaps this year will be different. Before we go any further, I want to recognize the hard work done by those on this year’s committee. I consider a number of them personal friends and have a great deal of respect for their diligence and intelligence. I don’t subscribe to the belief that only elected school board members and district leadership are capable of offering insight into school policy, and I’m always interested to hear what others have to offer. We need to focus more on policy and less on personalities. The job is a daunting one, and I appreciate the committee members’ willingness to undertake it. I will admit that I actually approached this year’s Report Card with some optimism. It was my belief that the folks putting together the Report Card would hear similar feedback to what I hear on a regular basis. 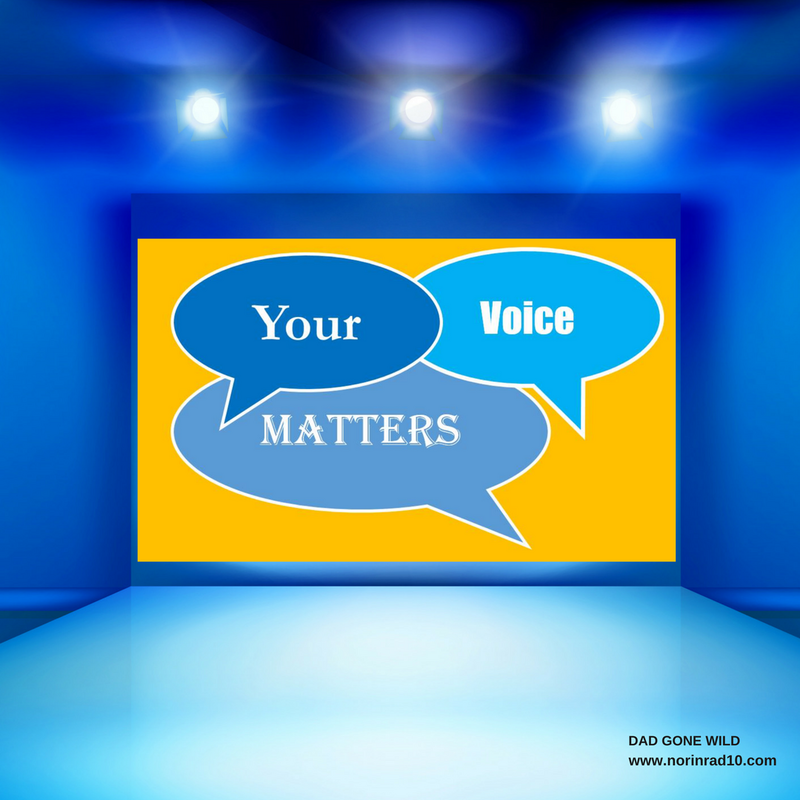 Feedback that continually remains unaddressed by the district. The committee was actually walking into an opportunity to lead. They had a pulpit and if they chose, they could shine a light on the true issues facing the district. That pulpit could be used as a vehicle to create an honest conversation where the MNPS school board and the Mayor’s office had failed to do so. That’s not quite what happened, but there is room for continued optimism. The Report Card committee chose to focus on an increased utilization of data. They did so while failing to recognize that this year, MNPS has introduced a more inflexible curriculum. Teachers have less ability to take that data and individualize it than at any other time in recent memory. This recommendation also fails to recognize that many parents have reached a saturation point with the over reliance on data. I will commend the committee for recognizing that teachers need more planning time. That has been a common refrain heard not only around MNPS this past year, but the entire state. They also deserve credit for recognizing the need for better practices when it comes to teacher recruitment and retention. I do take a little objection to the focus on diversity hiring. Don’t get me wrong. I fully understand and support the need for a diverse staff. However, MNPS’s staffing needs right now are so great that I personally feel the recruiting of quality teachers should be our first and foremost goal. A perusal of MNPS’s employment listings currently show 181 certified positions as being open. That should be unacceptable to us all. I also commend the committee for pointing out that there is no way to measure the district’s ridiculous vision statement of being “the fastest improving district in the country.” Of course that didn’t deter Dr. Joseph from minutes later promising that we would meet that goal in the coming years. It’s like promising to be the best looking kid in school. How do you back that claim up? There are some points in the Report Card things I question. For one, it cites Dr. Joseph and his team’s commitment to equity and urgency, yet nowhere in this report are English Language Learners mentioned. EL students make up a substantial portion of our student population, 22% according to the included charts. That’s up from 16% two years ago. The EL department has done exceptional work over the last several years, managing to outperform the state’s annual mandated outcomes by large margins. That work needs recognition. There was plenty of talk about literacy and our increased focus on improving literacy numbers, yet there was no talk about the implementation this year’s literacy plan that has been almost universally rejected by teachers. This is where an honest conversation is needed. We can focus on literacy all we want, but without a plan that teachers and principals are willing to invest in, that focus is meaningless. If you want grass to grow, you can’t just stare at it, declare it to be the fastest growing grass in the country, and will it to happen. You have to fertilize it, water it, make sure it gets enough sunlight, and then it will grow. You have to follow universally-recognized and current best practices or you will never have the best lawn in the neighborhood. The committee also got it wrong when they cited an increase in site-based budgeting this year. Sure, principals had more money, but they had less flexibility. Look at it this way. I give you an allowance of $10 and allow you to spend it on whatever you want. I then raise your allowance to $12, but dictate what you have to spend $4 of it on. Did I really raise your allowance? That’s how the game worked for principals this past year. At that point, I wasn’t ready to entertain that view. After spending some time with the report, I’ve come to the conclusion that they are right. It wasn’t a flattering report and there is a lot of meat in it that could lead eventually to an improved evaluation. Contained within is the basis for an honest conversation if we choose to have it. So the choice really becomes ours. Focus on the primary recommendation and the people who gave it, or take the report, use the information curated, and have an honest conversation about our schools and how to improve them. Tuesday evening, I was scrolling through my social media accounts and came across some pictures from the MNPS central office “Holiday Hoedown.” Apparently, MNPS central office employees had a big holiday shindig that included giveaways like a 65-inch color TV and $50 Walmart gift cards. “Tone deaf,” I muttered to myself as I scrolled on. Teachers weren’t content to let it go at that, and some questioned the district’s Public Information Officer Michelle Michaud via Twitter about the appropriateness of giving away TV’s while teachers were using their own money to buy anchor texts required by the new literacy plan and copier paper. Michaud responded by saying that all district employees had been invited, an assertion that later proved to be untrue. Pressed further on the issue, she responded by blocking the questioning teachers. Needless to say, the issue began to blow up. TV news stations began to take notice. Bus drivers chimed in that they hadn’t been invited to the party either. Teachers pointed out that the parties at their individual schools were nowhere near as extravagant and one teacher remarked to me that at their party teachers received bread. Not the dough that Michaud was referring to in her tweets, but actual bread. Once again, Dr. Joseph and his team found themselves in another avoidable controversy. I’ve had a number of people remark to me that they think this is silly criticism. My counter to that is that it isn’t about the party, but rather that this is just one more indication of the culture being cultivated. Dr. Joseph may talk a lot about respect for teachers but his actions don’t backup his words. Teachers are still waiting for an MOU despite the Collaborative Conferencing work being wrapped up and turned over to legal in October. There has been little adjustment in the the literacy plan despite teachers voicing concerns through several avenues. In fact, as previously mentioned, teachers are having to buy copies of texts needed for curriculum they’re being told is required. In the last budget hearing, teachers had to show up en masse in order to prevent a 3% raise from being cut to 2%. They are still buying copier paper and other needed supplies out of their own pocket as well. So forgive them if they take exception to central office holding a hoedown where extravagant prizes are handed out. Once again though, when presented with an issue that could easily be defused, the administration chooses to throw gasoline on it instead. Michaud responded by giving out false information and then proceeded to block a teacher from what she has said is an official MNPS account. Neither should have happened, and thank you to board member Jill Speering for recognizing that and tweeting out, “I’m embarrassed that one of our employees would treat you this way.” I’m told that apologies were eventually issued, but they weren’t done in a manner nearly as public as the rest of the exchanges, and no official acknowledgement was ever given by Dr. Joseph. Nobody is begrudging central office employees a Christmas party. Nobody is insinuating that the work they do is less valuable than classroom work. What is being asked is that people recognize the work and sacrifices teachers make every single day. Recognize the money that comes out of their own pocket. Recognize the time sacrificed away from families. This year, the level of stress experienced by teachers is significantly higher than it has been in previous years. I don’t think it is unreasonable to question where the money for prizes comes from or the terms of agreement if the prizes were donated. Failure to recognize any of the aforementioned is not part of a recipe for success. I’m not sure what that means, or who he’s forgiving, but I don’t see any acknowledgement of his role in the controversy being stated. The party may seem like a trivial thing, but understand that when you have a toxic culture, it’s often the seemingly inconsequential things that break out. Effective leaders don’t dismiss those instances as inconsequential, but rather use them as a springboard to a deeper, more honest conversation. I find myself continually questioning whether this administration is capable of such a conversation as the evidence to the contrary continues to mount. Once again, knowing history can allow us to make better decisions about the future. MNPS Directors battling with news reporters is nothing new. Dr. Pedro Garcia engaged in a running feud with WSMV reporter Larry Brinton to the extent that it led one school board member to remark, “I suspect what has clouded Dr Garcia’s judgment is his anger at [WSMV reporter] Larry Brinton.” That board member was referring to events connected to long-time Garcia ally and MNPS employee Gene Hughes. Board Member Nevill concurred, “This fight was between Larry Brinton and Pedro Garcia. I believe that we’ve allowed a fight with the media to damage us considerably. And that’s silly. That’s just silly.” Hmmmm… sounds familiar. The Hughes situation itself is eerily similar to current events involving recently departed administrator Mo Carrasco. Read the whole article, “The Lover’s Quarrel” published back in 2003, and I suspect you’ll get a strange sense of deja vu. The scary part is that despite the writing on the wall, it took 5 more years to take corrective action back then. Maybe Dr. Joseph is studying history and betting we’ll repeat it. Thanks to the week’s activities, creating poll questions this week was pretty easy. The first question asks what is your impression of this year’s Nashville Chamber of Commerce Report Card? Is it a good read? Do you like the recommendations? Do you think the whole thing is useless? Let me know. Question two is about the great Christmas party controversy. Warranted or not? Lastly, since we as a district are focused on literacy, I wanted to ask, what do you plan to read over this holiday break? Feel free to write in your answers. That’s it for now. I hope everybody has a great holiday. If you need to contact me, you can do so at Norinrad10@yahoo.com. I try to promote as many of the things sent to me as possible, but I do apologize if I fall short – Ms. Goodenough. I have started using Patreon. If you think what I do has monetary value, you can go there and make a donation/pledge. Trust me, I know I ain’t going to get rich, but at the end of the day I’m just a Dad trying to get by. Check out the Dad Gone Wild Facebook page as well. Want to bet that somewhere, Carrasco, Blankenship, Felder and Narcisse are secretly thanking MichMich for taking the focus off of them for a bit this holiday season? No need to apologize. I appreciate all you do to condense and make sense of all the things going on in the district. Keep up the great work! Thank you for sharing the excerpt from Dr. Joseph’s email. I found it to be a distasteful response to supposedly “valued” employees, especially given the context. I’m glad it wasn’t just me. Wow!! 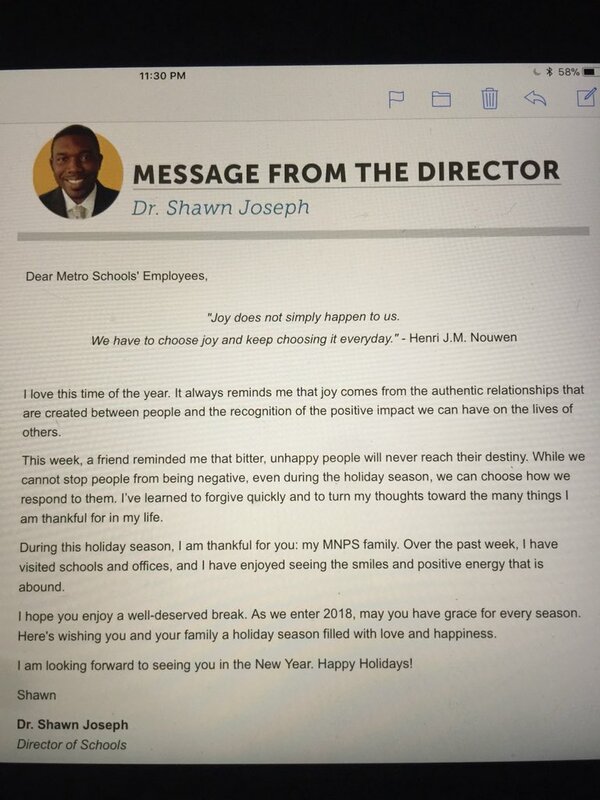 So I just saw our “holiday message” from Dr. Joseph and is it me or does that sound like a bitter man who has never seen the likes of the Nashville media? Big deal Shawn! Does he think he is the only school director in history who has seen negative stories in the local media? The level of passive aggressiveness in that letter is monumental. Just have the erratic PIO apologize for Christmas sake. A simple tweet will suffice. I don’t know if it is just me, but I can feel an “awakening” happening from my fellow teachers. The sleep is being scrubbed from our eyes and hopefully, our elected board and council will wake up as well. You are spot on about the party. I think those that are stepping in to defend the administration on social media and in the comment sections of channels 4 & 5’s FB pages are missing the big picture. It really isn’t the party that has upset the teachers and those in the community. It is the total lack of respect for teachers that we have known for a while, it was just magnified and shown to the community by the PIO’s incompetence and then made worse by blocking a teacher from following her. It would be one thing if that was her personal Twitter account, but by having MNPS in the username, that signifies it is an official account. I am glad that she did that because it has brought into the light what we have known for the last 18 months. This administration has zero respect for those of us that are in the classroom everyday trying to jump through and around every obstacle and hoop they throw our way. It is hard to be “the fastest growing urban district,” when our path to get there is filled with road debris and detours pop up around every corner. Just my two cents… Happy Holidays and thank you for this forum to discuss and vent.